delicious. This simple dish consists of a fried, paper-thin type of bread, cabbage, carrot, some meat (unless you order vegetarian but like hell am I going to do that), and spices. For something with so few ingredients you wouldn’t have thought that it would differ from one eatery to the next.. Not so. I’ve eaten some great kottu and some truly awful kottu, I’m now too nervous to order it for fear of it being revolting. Luckily, there are so many other great things to order. Some of the best Sri Lankan food I’ve eaten has come from the local ‘hotels’. Something has seriously got lost in translation here, because they are not what you would consider a hotel to be– even by the largest stretch of a lunatic’s imagination. They consist of a small well-worn room with some tables and chairs, an open hotplate/ kitchen area at the front and some food display cabinets filled with a variety of cooked foods. These places serve the largest portions of food at super cheap prices and are always full of the locals; this usually implies the food is good and shouldn’t kill your lower intestine. 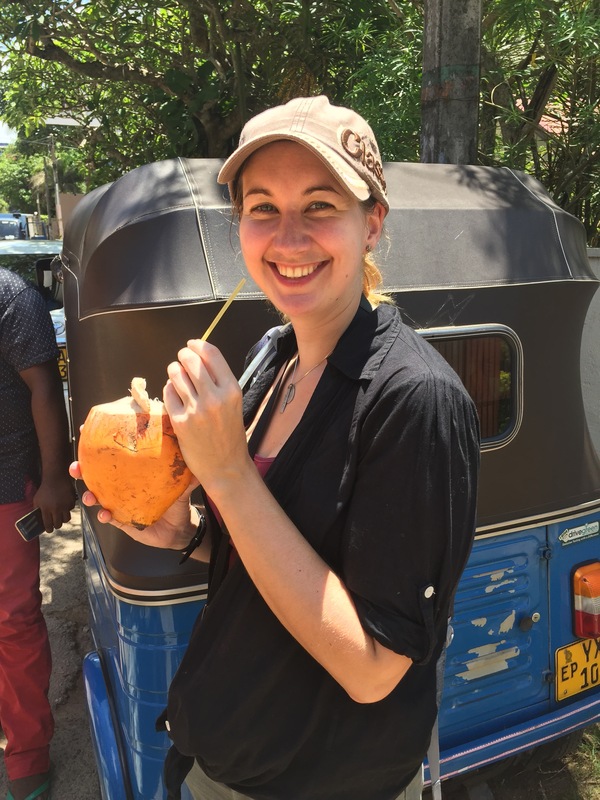 As with their tuk-tuk driving these places also have a time management quirk: why wash up plates when you can cover them with a plastic bag, plop the food on top and then whip it all off into the bin after the customer has eaten? Ingenious. Some people have a sweet tooth but I’m convinced I have sweet blood. I honestly wouldn’t be surprised if a doctor opened me up only to find that I have some form of thick syrup running through my veins. With that in mind, it’s no surprise that back home there are very few desserts I haven’t tried, so imagine my delight when a traditional Sri Lankan dessert was described to me as being ‘very sweet’. It was called watalappan and it doesn’t make a good first impression. Think of the filthiest brown-coloured water you can imagine and you won’t be far off. That is the colour of watalappan and it just sits on the plate like an uninviting block of squidge. They (although I’m not entirely sure who they are) always say not to “judge a book” by its cover, and from past experience, I’ve baked some fantastic-tasting cakes. But my attempts at decorating the sponge always ended up looking as though an angry child had taken a sledge hammer to a tube of icing, threw it against the wall and then spewed up on it. With that in mind I pushed aside my initial reservations and took a massive spoonful –it was fantastic. It had the consistency of a crème brûlée with a thin topping of sugar, just like you find on a glazed ring donut. Turns out it is just coconut milk, sugar, condensed milk (which I have a bad habit of eating whole cans with a spoon!! ), cashews, eggs and spices. So far Sri Lanka was doing well. With the exception of the odd strawberry or raspberry stall which pops up randomly during summer in the country, we don’t really have food stalls on the side of the road in the UK. But over here they’re everywhere and some of them are even mobile, it’s like food is following me and I love it. 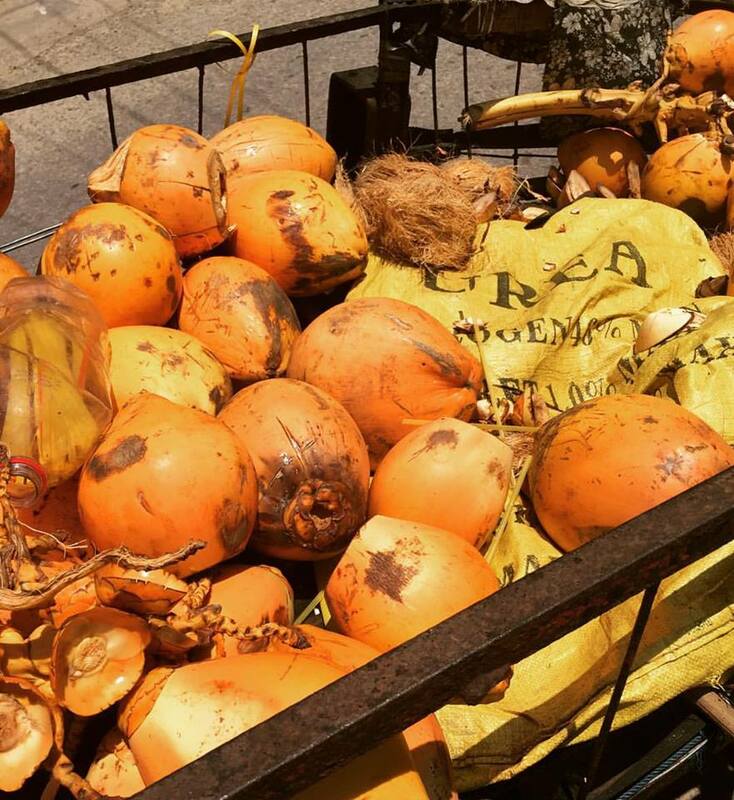 Anya introduced me to the uber-touristy fruit, the king coconut. 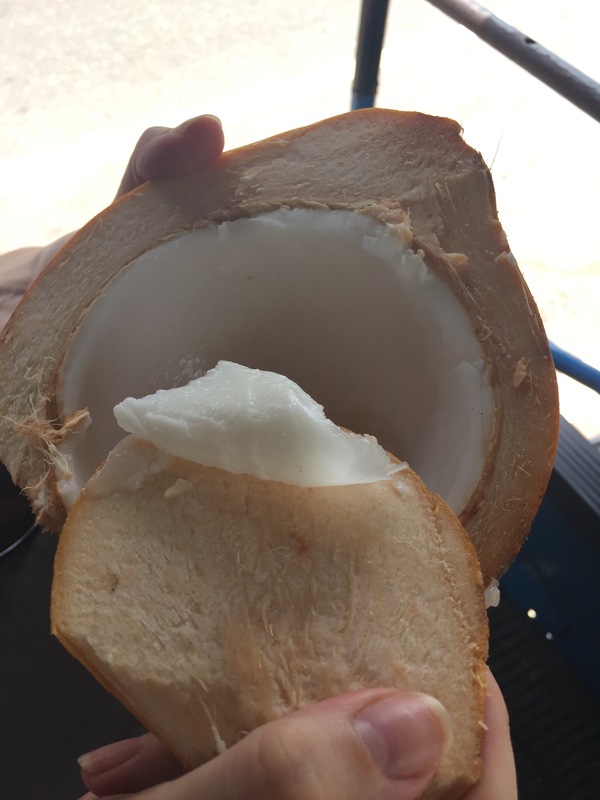 It is over twice the size of the brown hairy coconuts, packed full of sweet water rather than milk and when you’re done drinking, it’s hacked open and you scrape out soft tasty fleshy goodness. It costs 25p!! You can almost buy a freddo for that! I used to think that I was really good at recognising my fruit and veg, even the odd weird things that pop up in the exotics section, but wandering through fruit markets here I am so confused. Most of the time I have no idea what anything is let alone how to eat it, but once again, Anya to the rescue (I should probably start paying her). I was recommended tiny velvet tamarinds, they looked like a tiny furry flattened bunch of grapes and they were stupidly fiddly to eat. Firstly, you have to squeeze them so the outer furry skin pops, then you remove the inner bit, scrape the flesh off with your teeth and spit out the large seed. So-o-o much effort and time for such a tiny sliver of fruit, but it is an amazing sharp sweet explosion on the taste buds and for someone as easily entertained as I am, it keeps me occupied for ages. I’m sure some days Sri Lanka is trying to confuse me more than usual, if it isn’t the unrecognisable food or the unpronounceable names, then it’s hiding the food places to begin with. A fellow traveller had mentioned a restaurant called Barefoot which apparently made some really nice food. So I went in search. It shouldn’t have been difficult to find, it was –after all– only a few paces down the road on the opposite side of the street, with the name plastered across the fascia in big bold letters. After the usual death defying stroll across the busy road I came to a big wooden door with an ‘open’ sign on it; which seemed a tad odd, because usually food places have windows. I pushed open the door and my brain was thrown into confusion –colourful cloth as far as the eye could see. Unless cloth eating was some local tradition I was unaware of, then surely I must have been in the wrong place. I did the usual thing when you walk into the wrong place, politely smile and begin to walk around pretending to look at everything and not let on that you’d entered by mistake. This place went on forever. It had loads on offer, from fabrics to stone carvings (how anyone gets any of those back without going over the luggage weight limit I have no idea), jewellery, paintings, cloth animals and a bookshop. This place was like the frigging TARDIS. Even if I wasn’t going to be able to quieten my loudly-raging stomach, I could at least let my eyes feast on pretty things. I continued my way through the seemingly never-ending shop until, without warning, steps and a courtyard appeared. I narrowly stopped myself flying down the steps, and joining the koi in the pond, by madly flailing my arms about like some freshly decapitated chicken. It appeared I had passed the test and found the restaurant. It was another beautifully well-planted courtyard restaurant. The food wasn’t anything incredibly special but when my drink arrived, I couldn’t help but crack up. I’ve seen some of the most lavishly garnished drinks, usually cocktails– mainly thanks to my friend Kimmie, but I had never seen anything like this, especially in a soft drink. I’d ordered a lime and lemongrass soda and it seemed to have been ‘decorated’ with 2 sprouting bulbs of what I can only assume was lemongrass. They were about 30 – 45cm long, almost 3 times as long as the glass! The table I was sitting at was teeny with nowhere to put this ‘decoration’ if I removed it. I tried taking quick sips from the opposite side of the glass but succeeded only in poking myself in the eye. I tried holding the pointy stems down but they kept slipping out and flicking me in the face, so I eventually resorted to taking each mouthful very slowly and letting the ridiculous thing flop over my face while I drank. I left with a full belly, a slightly aching eye and with another amusing memory.